The Harris Chain is a wonderful place to canoe or kayak if you know where to go and what to avoid. These lakes are big with miles of open water. The main lakes can become very rough in bad weather and numerous power boat wakes make paddling a canoe or kayak stressful and potentially dangerous. Fortunately, there are many areas that can be enjoyed in a small paddle powered craft. One of the best areas for Harris Chain canoe and kayak exploring is Haines Creek. This six mile long canal connecting Lake Eustis and Lake Griffin remains natural with numerous cypress trees and native plants lining the shoreline. 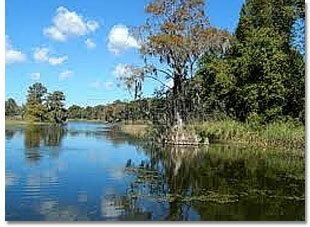 In the spring of the year, the trees hold the nests of Florida water birds like egrets, ospreys and herons. Watching the interaction between parents flying back and forth and baby birds is a real bird watchers delight. You have never heard a noisy bird until you have heard a hungry blue heron baby! 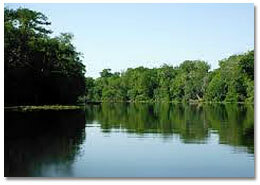 Another area very popular with canoe and kayak enthusiasts is the Dora Canal. The Dora Canal connects Lake Dora with Lake Eustis and can be easily assessed from the Tavares boat ramp located on highway 441. 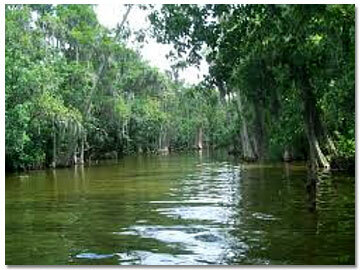 Parts of this canal are thousands of years old with the remnants of huge ancient cypress trees along its banks. The County has created a "blueway" in this area, which is a marked path similar to a hiking trail created specifically for paddling and kayaking. Lesser known, but just as interesting is the Double Run area at the bottom of Little Lake Harris. Two spring runs converge into a large bay dotted with lily pads, downed trees and free standing cypress. The eastern most run is longer with numerous bends leading back into a spring area in the rear. Be sure to visit the weird "double tree" on the left as you paddle in where you will find a full grown palm tree growing directly out of a cypress tree trunk. Alligators are common in the Harris Chain, but are not dangerous to canoe or kayak travelers. The rule of thumb is "If you don't mess with them, they won't mess with you". All of the above mentioned places have great fishing, so take your poles! If you have any questions about canoeing or kayaking the Harris Chain, please contact us.